Potato starch is a fine, white powdery substance derived from potatoes. Similar to other starches, it is commonly used to thicken, gel, texturize and increase crispiness in baked goods. It is also used in clear soup, confections, fillings, and so on. Properties such as high water-binding capacity, low gelatinization temperatures and tendency to form relatively clear, highly viscous pastes are some of the most beneficial aspects of using potato starch in food systems. Potato starch is largely resistant to digestion in the small intestine. Since it is an uncooked resistant starch, it can be categorized as RS 2.4 It is gluten free. 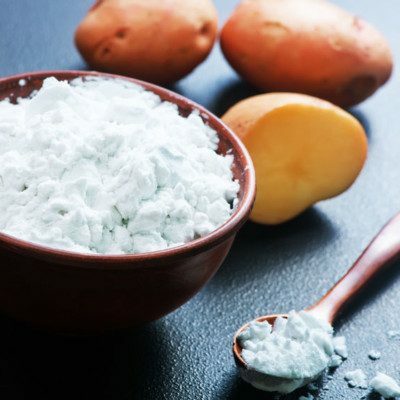 Traditionally, potato starch is extracted from potato cultivars that are rich in starch, typically, 22%.2 The process consists of washing the potatoes, disintegrating them to break the cells open and release starch granules along with broken cell wall and other cell contents. Normally, sulphur dioxide is added to inactivate oxidative enzymes and prevent discoloration. Disintegration can be done using hammer mills (U.S.) or rotary saw blade rasps (Europe). The macerated potato is forced against a screen through which starch and fibre are physically removed from the juice. The pulp is screened through a rotary sieve and concentrated using a continuous centrifugal separator where fiber and extraneous matter are removed. Similar to other starches, potato starch can be modified via degradation or cross-linking to improve its functionality. Fat replacers (mainly enzyme-treated type). For extended refrigeration formulations – ready to eat pies and meals. The FDA identifies starch as that from corn and mandates that if it comes from any other source, must be labelled accordingly. It also strictly regulates modified starches (specific requirements can be found here). Grommers, Hielko E., and Do A. van der Krogt. “Potato starch: production, modifications and uses.” In Starch, pp. 511-539. Academic Press, 2009. Semeijn, Cindy, and Pieter L. Buwalda. “Potato Starch.” In Starch in Food, pp. 353-372. Woodhead Publishing, 2018.Semeijn, Cindy, and Pieter L. Buwalda. “Potato Starch.” In Starch in Food, pp. 353-372. Woodhead Publishing, 2018. Singh, Jaspreet, and Lovedeep Kaur, eds. Advances in potato chemistry and technology. Academic press, 2016. Englyst, Hans N., S. M. Kingman, and J. H. Cummings. “Classification and measurement of nutritionally important starch fractions.” European journal of clinical nutrition 46 (1992): S33-50. Onyango, Calvin, Christopher Mutungi, Günter Unbehend, and Meinolf G. Lindhauer. “Modification of gluten-free sorghum batter and bread using maize, potato, cassava or rice starch.” LWT-Food Science and Technology 44, no. 3 (2011): 681-686. Silva, D. A. Q., E. M. C. de Azeredo, A. L. Wahanik, M. S. Schmiele, Y. K. Chang, and M. T. P. S. Clerici. “Gluten-Free Cookies with Potato Starch and Modified Albumin: Development, Technology, Nutrition and Evaluation Sensory.” In Gluten-Free Diets: Food Sources, Role in Celiac Disease and Health Benefits, 170-83, 2014. Huber, Regina, and Regine Schoenlechner. “Waffle production: influence of batter ingredients on sticking of fresh egg waffles at baking plates—Part I: effect of starch and sugar components.” Food science & nutrition 5, no. 3 (2017): 504-512. Witczak, Mariusz, Jarosław Korus, Rafał Ziobro, and Lesław Juszczak. “Waxy starch as dough component and anti-staling agent in gluten-free bread.” LWT 99 (2019): 476-482.